Deca KimonosTM on Etsy: click here to see more . . . 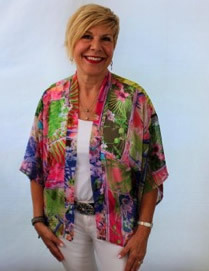 Size 1 fits all sizes 4-10, with a back length of 29"
Size 2 fits all sizes 12-14 with a back length of 32"
in this lightweight chiffon kimono. 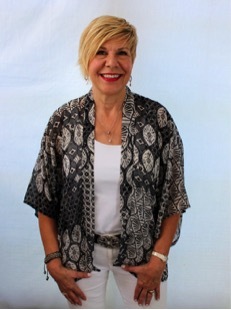 Featuring a neckband, side slits, and flowy sleeves.